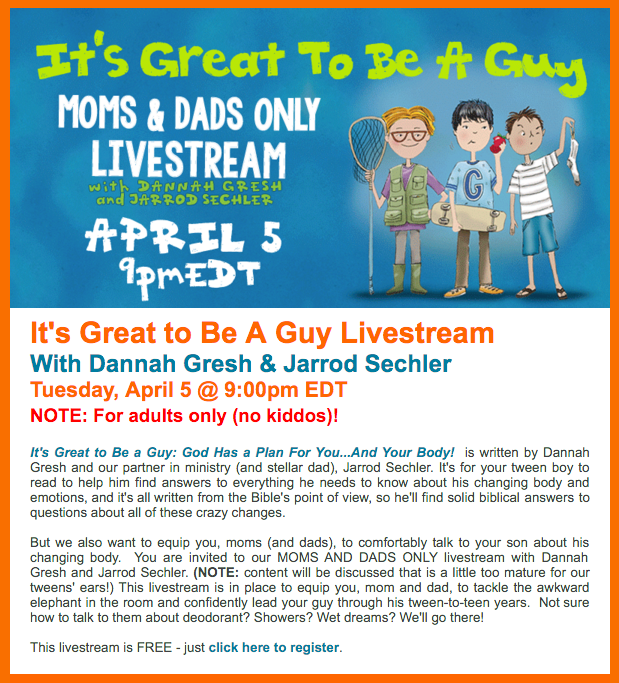 It’s Great to Be A Guy (livestream event) with Dannah Gresh & Jarrod Sechler on Tuesday, April 5 @ 9:00pm EDT. NOTE: Livestream event for adults only (no kiddos)! Organized by Secret Keeper Girl Ministries. 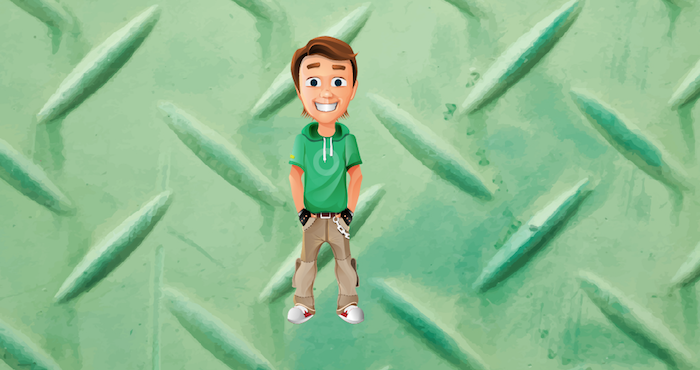 Moms and Dads, “It’s Great to Be a Guy: God Has a Plan For You…And Your Body!” is written by Dannah Gresh and partner in ministry (and stellar dad), Jarrod Sechler. It’s for your tween boy to read to help him find answers to everything he needs to know about his changing body and emotions, and it’s all written from the Bible’s point of view, so he’ll find solid biblical answers to questions about all of these crazy changes. (This book is set to be released on April 1, 2016.) Godly men don’t just happen. Boys must be trained, mentored, and taught how to be godly so they can lead the next generation. It’s Great to Be a Guy helps you do that from a fun, practical, and most importantly biblical standpoint. But we also want to equip you, moms (and dads), to comfortably talk to your son about his changing body. You are invited to a MOMS AND DADS ONLY livestream with Dannah Gresh and Jarrod Sechler. (NOTE: content will be discussed that is a little too mature for our tweens’ ears!) This livestream is in place to equip you, mom and dad, to tackle the awkward elephant in the room and confidently lead your guy through his tween-to-teen years. Not sure how to talk to them about deodorant? Showers? Dreams? We’ll go there! This livestream is FREE – just click here to register.